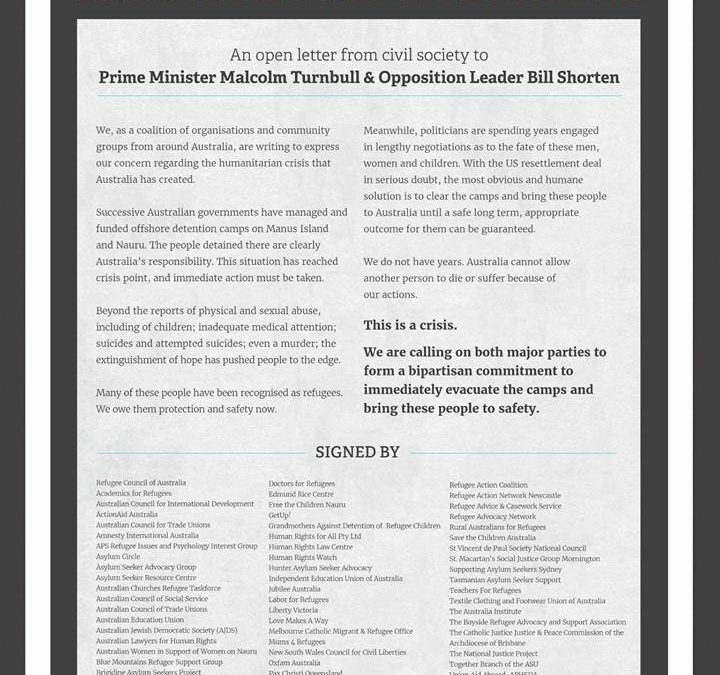 The signatories in this ad in today’s papers couldn’t give a damn about the individuals on Manus or Nauru OR they are so misguided they don’t understand the consequences of what they’re suggesting. These two thousand or so are simply being used as tools to force a weakening and an eventual breakdown of Australia’s immigration and border laws and as an opportunity to create an open borders situation. This is the same far left rabble taking to the streets i…n the US that want a total a breakdown in society and their own vision of a dystopian and chaotic state. I find it interesting but not surprising that they would fire up this last ditch, desperation attempt and campaign, right at the time Trump has said he would (begrudgingly) honour Obama’s “dumb deal”. One would imagine if the activist rabble were genuinely interested in their welfare they would be delighted that a solution had been found in another first world county. But no, they’re not delighted at all because THIS solution is not THEIR solution as it totally derails and sidelines their relevance and their chaotic, open borders, let it rip agenda. The Australian governments logical position is that to allow them in would simply give the people smugglers the opportunity to start up again and market Australia as a destination of choice to all comers.